On the 11th July 2010 a special service was held at Lauderdale Road Synagogue to celebrate the completion of a new Sepher Torah. 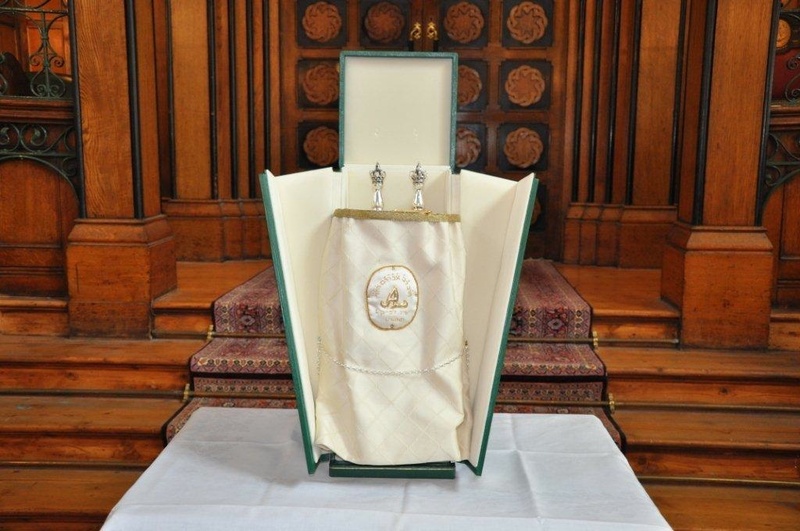 The Sepher Torah was a gift from Estelle to her husband Rabbi Abraham Levy. The Sopher was Rabbi Levys’s cousin Yossi Anahory who lives in Israel. The cloak was embroidered by Estelle using a real gold band from an old Moroccan wedding dress of the family. 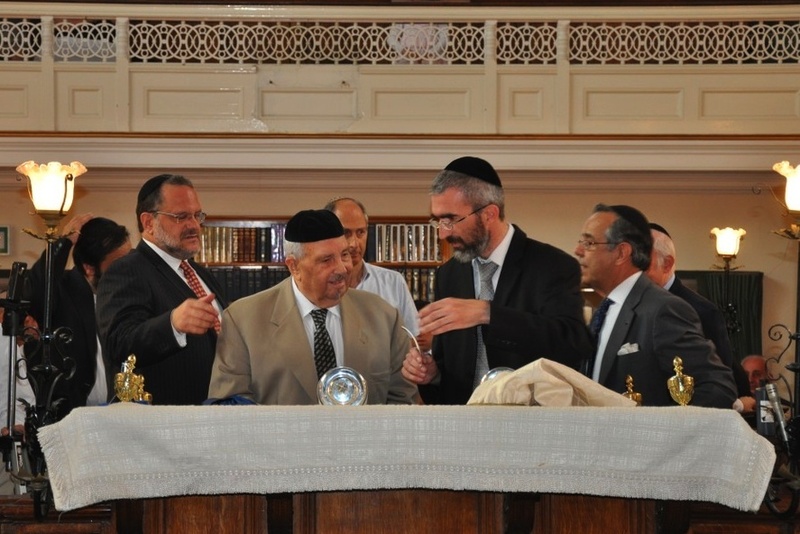 The pointer was a copy of that given by Aaron Cardozo to a Gibraltar Synagogue. Cardozo was a good friend of Admiral Nelson, he was a good Jew and a good citizen of Gibraltar who was responsible for providing supplies for the Battle of Trafalgar. The box for the Sepher was a gift from the Tunisian Government who invited Rabbi Levy recently to attend Lag Ba’Omer celebrations in Djerba. He asked his guests where he could order a box for the Sepher Torah and within three days they made a leather box for him as a present to mark his visit. 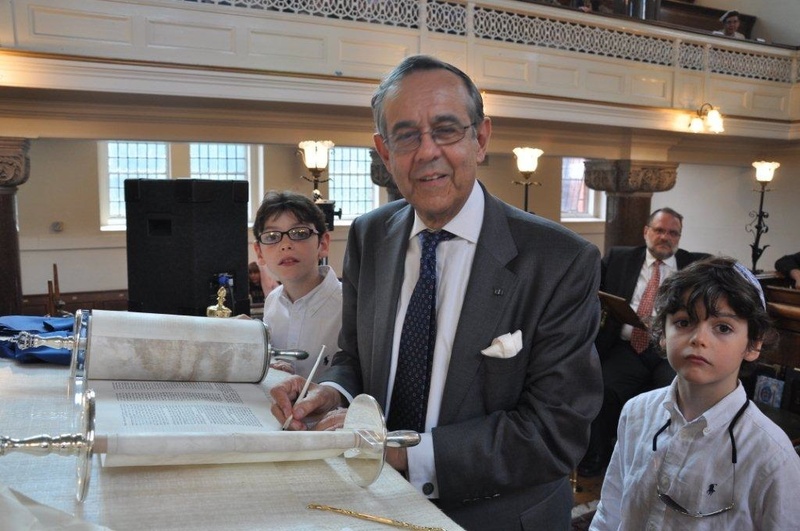 Rabbi Abraham Levy adds one of the final letters to the new Sepher Torah. The Sopher was Rabbi Levys’s cousin Yossi Anahory who lives in Israel. Dr Naim Dangoor is called up to write one of the final letters of the new Sepher. The new Sepher Torah. The cloak was embroidered by Estelle using a real gold band from an old Moroccan wedding dress of the family. This entry was posted in Community and tagged Naim Dangoor, Rabbi Abraham Levy, Spanish & Portuguese Synagogue. Bookmark the permalink.